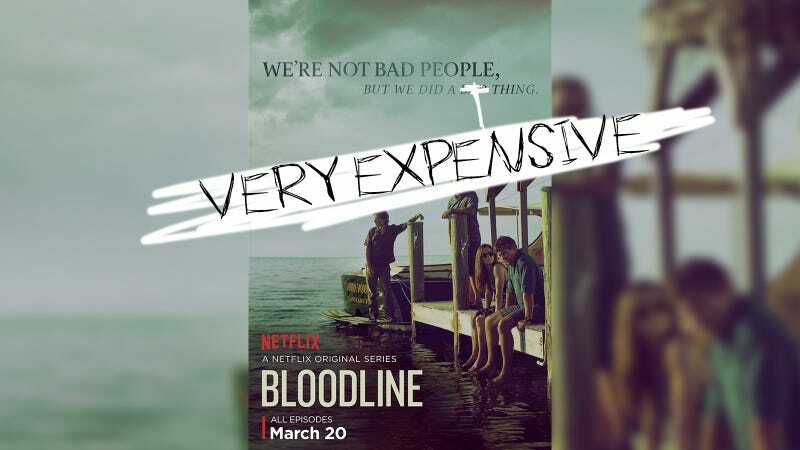 A piece about the cancellation of Netflix’s Bloodline published by Vulture Thursday afternoon revealed that each episode of the series (which is scheduled to end after its third season) cost “somewhere between” $7 and $8.5 million. Think about this for just a few seconds, and every muscle in your face will go limp: a family thriller starring Kyle Chandler and Sissy Spacek set in the Florida Keys that my coworkers inform me is “filled with people squinting” and taking “pregnant pauses” that wasn’t filmed in IMAX 3D and does not contain a single superhero, animated animal, or full-size replica of the Titanic will have cost Netflix somewhere between $210 and $255 million dollars. Do you know what movies cost less that three seasons of Kyle Chandler and Sissy Spacek staring at each other and quietly attempting to convince both each other and themselves that they’re not bad people? I’ll give you 10. Expensive thing it has that Bloodline doesn’t: A spaceship containing Anne Hathaway that travels through a black hole!!! Expensive thing it has that Bloodline doesn’t: A plane that crashes into a mountain while Brad Pitt and several zombies are inside it!!! Expensive thing it has that Bloodline doesn’t: Talking apes that know how to shoot guns!!!!! Expensive thing it has that Bloodline doesn’t: Will Smith at his peak!!!! Expensive thing it has that Bloodline doesn’t: A giant computer-generated gorilla holding Naomi Watts up as Jack Black watches!!! Expensive thing it has that Bloodline doesn’t: Both BB-8 AND Oscar Isaac!!! Expensive thing it has that Bloodline doesn’t: RIHANNA ON A BATTLESHIP. Expensive thing it has that Bloodline doesn’t: Heath Ledger!! !